A couple months ago I made another gelatin mold and plaster casting in my efforts to refine that process, and test the proportions of preservatives for the gelatin. At primary issue was keeping a mold viable for the longest period possible, to see how long the mold could be kept in a sealed container for future use. The initial steps went perfectly. Then my vertigo attack became manifest and I did not get back into the shop for more than two weeks. Unfortunately for the mold and the plaster cast in it, it was just sitting on my bench and became desiccated and warped in the intervening fortnight. Not good. The mold became hardened and crushed the casting as it warped. My next step is to see if the damaged mold can be resurrected with hot water or steam. I’ll let you know what I find. PS – Vertigo per se is gone, but I’ve had lingering dizziness which I describe as “being fuzzy around the edges.” As long as there is no excess motion around me or I do not have to turn my head quickly I can manage. Extensive and thorough medical examinations have yielded nothing yet. I’m hoping it all goes away on its own. Glad you are feeling better, check for your posts every day. Hi Earl, I am somewhat familiar with that particular problem and did the head orientation manipulations, which seemed to help. Why use such an ephemeral mold material? 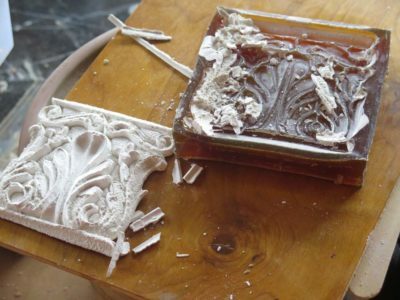 I don’t cast but your plaster test cases have always–used to be–been the mold material of choice. But, everyone experiments; some just not as stubbornly. Re: Vertigo. My SIL–I can’t resist a nod to alphabet soup acronyms–suffers similar. She flew to see a Chicago spec. who ordered special glasses, including yellow lenses. Just sayin’. Just call me Captain Ahab, chasing historical/ancient technology to see if it can be made to work in the modern age. Have you prayed about your vertigo? It could be just a thorn in your side or maybe something is to be learned…hope you are comforted in the answer you get! God bless you! Indeed I have, as have others on my behalf. It is getting better incrementally to the point where I would not call it vertigo, just some latent dizziness “around the edges.” I am fully functional but slowed somewhat until it disappears altogether. I can walk up the steep driveway to the barn, just a bit slower than normal. As in the instance of my broken hip, I asked, “Lord, what is the purpose You want me to learn from this?” There was one then, there will be one now.